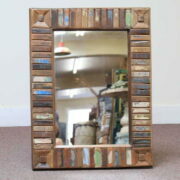 A vintage door made into a stunning unique mirror. 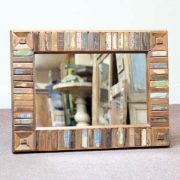 This is a cute little vintage door which has been upcycled into a hidaway mirror. There are remnants of old cream, green and brown paint all over giving it an old and used look to it. 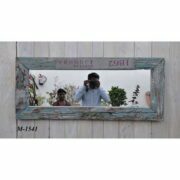 The door itself has been salvaged from a disused building in the state of Rajasthan. 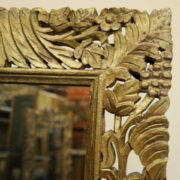 It has carved edges and some metal work with studs throughout. 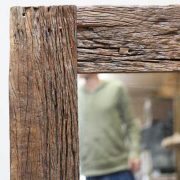 The frame has then been created around this, from various reclaimed timbers. There are two small ring and sun handles which open the doors to show the mirror behind.